Homemade Southern Style Blackberry Custard Pie. 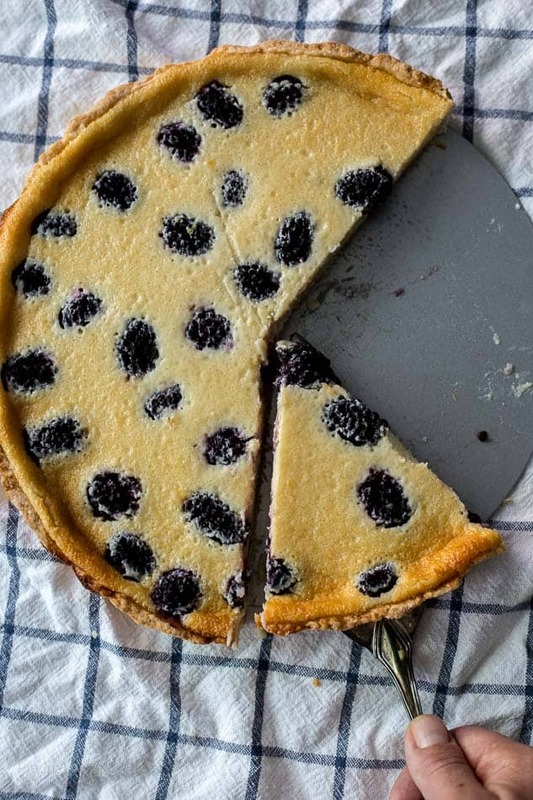 From-scratch crust, creamy custard filling and fresh blackberries baked together into a comforting dessert. 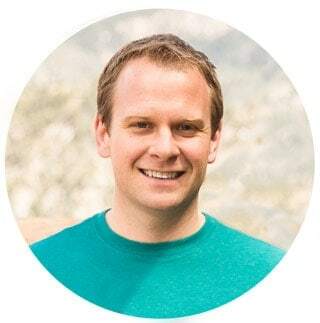 Have you ever gotten excited about that deal on produce at the grocery store or the crate of fruits you bought at that farmers market, only to have it spoil before you can finish them? While there’s ways to store produce longer such as freezing or canning, it’s wonderful fresh and at peak ripeness. 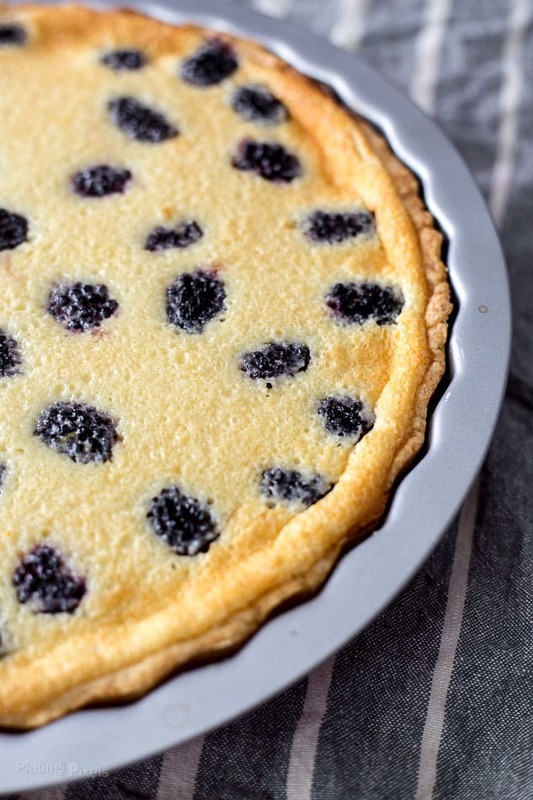 Of course if you find yourself with too much summer berries, you can always make this Southern Style Blackberry Custard Pie. It’s an authentic homemade pie, with a from-scratch crust, creamy custard buttermilk filling baked with ripe summer blackberries. A food processor is used to speed up the crust assembly and filling. Pulsing sugar, flours and butter cuts it all together in seconds. The custard filling consists of buttermilk, butter, egg, sugar, flour, orange zest and vanilla. The trick is to slowly pour in the egg, then the buttermilk while blending to create an emulsion, similar to a hollandaise sauce. This prevents it from separating while baking, creating a thick custard-like crust. 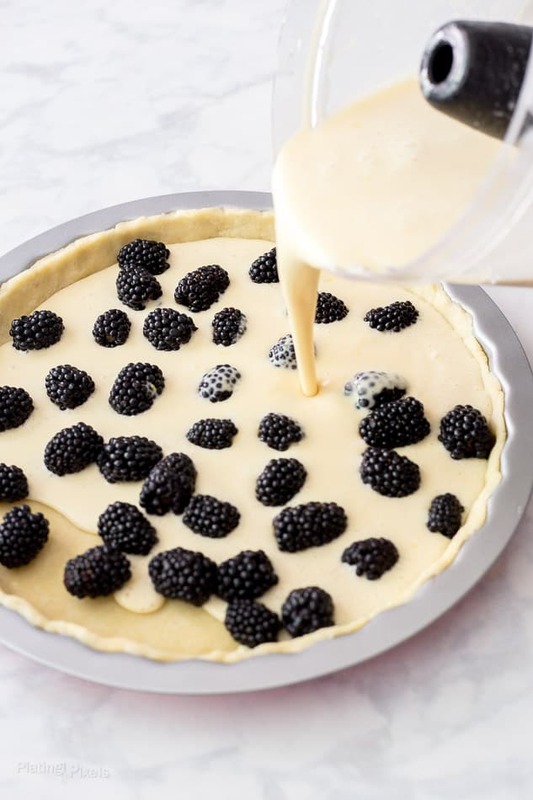 The filling is poured over fresh blackberries, which all bakes together into a Southern Style Blackberry Custard Pie. 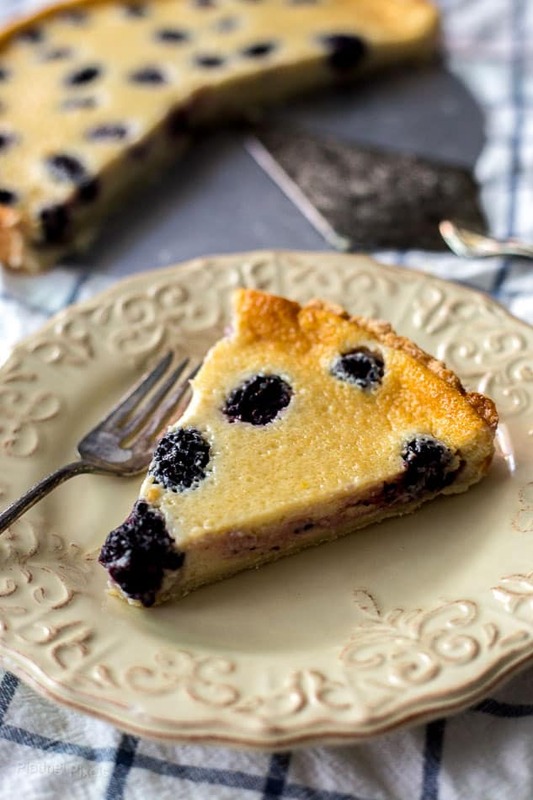 This Southern Style Blackberry Custard Pie will be a family favorite thanks to summer berries that stay fresh longer. It’s a classic dessert that’s comforting and refreshing. From-scratch crust, creamy custard filling and fresh blackberries baked together into a comforting dessert. In a food processor, pulse together flours, sugar and salt until combined. Cut butter into cubes and pulse into mixture until it makes a coarse meal, with visible small chunks. Add in the buttermilk and pulse just until moistened. It should still have small pieces and not yet formed into a ball. Empty mixture onto a lightly floured flat surface. Using your hands, press mixture together until it forms a ball. Wrap in plastic wrap and chill at least 45 minutes or overnight. When ready to prepare pie, place dough on a floured surface. Use a rolling pin to create an 11-inch circle, sprinkling both sides with flour as needed. 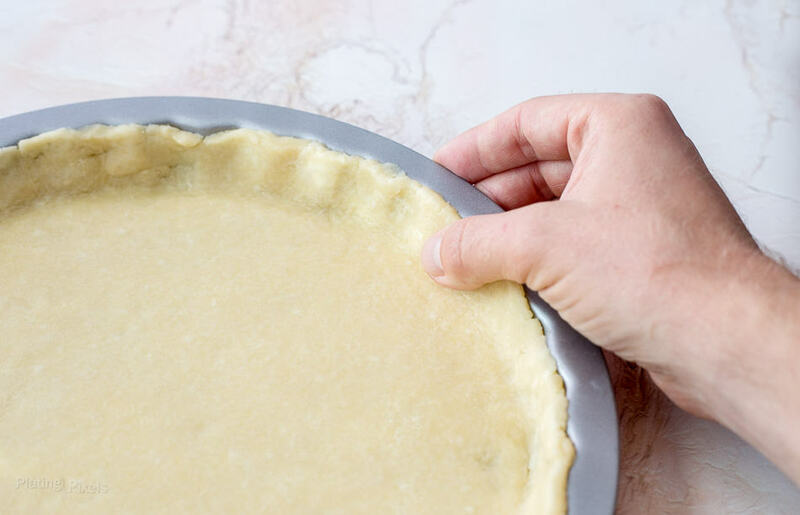 Roll dough around pin then unroll into a 9-inch pie or tart pan. Press the dough into the bottom and sides of dish and trim off any excess. Store in fridge until ready to add filling. 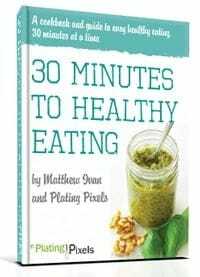 Preheat oven to 350° F. Place sugar, butter and flour in food processor, pulse until combined. With machine running slowly, pour in eggs in a thin stream just until combined. Scrape sides, then start machine again and slowly pour in buttermilk in a thin stream just until combined (this is critical to create an emulsion). Quickly pulse in orange zest and vanilla. Evenly place blackberries in bottom of pie shell. Pour buttermilk mixture over berries. Place in center of a rimmed baking sheet and bake about 40 minutes, or until edges are golden and center is set. Cool completely on a wire rack before serving. Recipe adapted from The Baker in Me. Print, 2016.